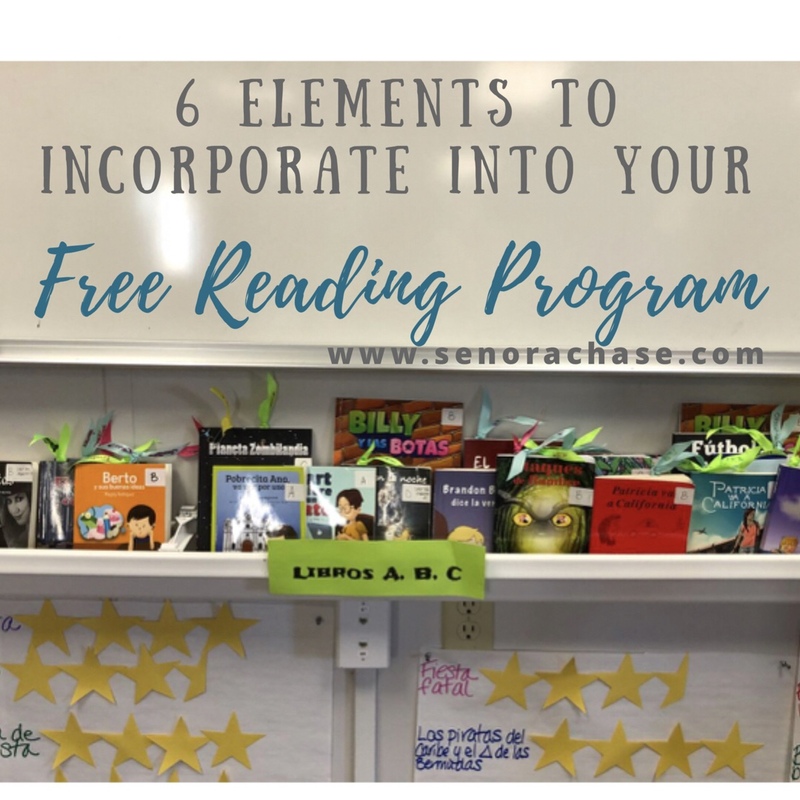 Last year I stepped up my FVR (Free Voluntary Reading) game. In the past I always had lots of children’s’ books available but it didn’t feel like a very good use of class time because they are too difficult to be comprehensible (and I suspect my little darlings were just looking at the pictures.) After attending NTPRS in Reno, I was convinced that free reading was the missing piece in my language instruction and I dove right in…and at the end of the year, I noticed that my students’ output was better than years past. Their timed writings were richer! They were writing in the past tense without any other input! I was finding words in their writing that I didn’t teach them! You guys, I didn’t do anything differently other than give my kiddos time to read and their Spanish got better! I didn’t do anything! In fact, I just sat on my stool and read too! Easy results! Score!! a. Students can select any book they want and read it for as long as they want. If it’s too hard to get into or not interesting, they should put it back and try another. There is no penalty for book shopping! I tell them that I’m happy to recommend books if they’re having trouble finding something good and it just tickles me pink when I pair them with a great book at their level. b. We read at the beginning of most classes. It’s such a peaceful way to start class and get their Spanish brain activated. I have a “Vamos a leer” laminated sheet that I magnet to the board so students know to get their book on their way into the classroom. (The back of “Vamos a leer” is “Vamos a cantar” because we sing on the days we don’t start with reading). c. They are to be totally silent during free reading. It’s sacred time and I don’t want any interruptions. And besides, I want to read too! 3. I leveled my books with a sticker on the front cover. It is not a scientific method at all…I just read a few paragraphs and decided a letter: A is easiest and H is most difficult. There’s probably a formula for leveling books but I don’t know what it is. I just wanted them to be able to choose a book they can read easily, so if they started a book that was too hard, they could try a lower letter. I choose letters intentionally rather than numbers because I didn’t want students to feel like since they were in Spanish 2, they had to read a Level 2 book. One of these days I’ll type up a document with all my book titles and their corresponding letter….but until then, here’s another picture. Here’s the list of my titles organized by level. 4. Bookmarks: I wanted an easy way for students to keep track of their place that would allow other students in another class to read the same book. Pintrest didn’t let me down and I made (ok, let’s get real here, I didn’t do it, I made asked my TA make 185 book marks!) book marks with large paperclips and ribbons. Each class has a different color, and students wrote their names on the ribbon with a skinny sharpie. When students finish a book and are looking for another, they know not to choose a book that already has their colored bookmark in it, signifying that one of their classmates is reading that book. Students are careful to not disturb another student’s bookmark while they’re reading, but if it falls out, they’ve been trained to attach the paperclip to the front cover (rather than just putting it in randomly!). I also have a jar at the front of the classroom where students put their bookmark if they finish a book and haven’t yet started another and it’s where I put bookmarks that fall out and I find on the ground. It’s working out great and how cute are they? We also Chit-Chat about our novels at the end of each reading session which became a it’s own post. 5a. What about kids who are not reading? : Well… I watch them, if I suspect a student is zoned out and not reading, I’ll walk by and snap them out of their trance. Usually they apologize and start reading. If I look at them again and suspect they’re just pretending to read, I’ll say quietly, “you can read now during class, or we can read together today at lunch.” That almost always works! Only once did I have to “invite” a little darling in for “mandatory” lunch reading…and guess what? We didn’t have any reading issues after that! In January I asked all my kiddos to give me some feedback on an anonymous survey. One my my questions was: “Are you really reading? Out of 180 kids, only 1 kid checked the option “I’m just pretending to read so Mrs. Chase won’t get mad at me.” The vast majority reported “I’m reading the entire time and working hard to stay focused”. I’ll take that…and I will make it my life’s mission to figure out who is that one kid who is pretending to read! Is that elastic paired with the rain gutter bookshelf? Haha! Yes! I was tired of the books flipping over when kids bumped into that one! I love all the ideas. How often do you read & for how long? We’re on a block schedule, so I see my high schoolers 2 or 3 times a week. We read 2x a week. In Spanish 2 we read for 10 min and Spanish 4 for 15 min. I’m started with my Span 1s after we get back from Feb break and I’m planning on 5-7 min once a week. Great post. I am wanting to start this and your strategies will definitely help. Question: How did you acquire your books? The State of NV passed a bill that allows teacher to be reimbursed for classroom materials, up to $120 per year. For the past 2 years I’ve spent every penny on books! I know a lot of teachers have good luck with Donor’s Choose to fund their classroom libraries. Good luck! Just discovered your blog, love it! I too share the desire to simply load them with input, and then have very few grades as a result…One question- can you share you list of novels for Spanish 1? I only have 6 and I need more ideas. Mil gracias! Thank you! Yes! I’ll work on a list of novels in my library next week! Hi. How many books do you display? I’m glad I found your post. And yes, please can you upload a list with titles for Spanish 1? I’m not sure…there are a lot. I’ll work on the list of titles this week! Señora Chase, new to the world of CI. Starting next year. Your website is inspiring and so helpful now that I am getting myself ready to start the journey! About the reading, for Sp. 1 or beginner students in middle school, how do you deal with students who would tell you: “I don’t speak Spanish, I can’t read…”? I just see myself telling them “You’ll be surprised how much you will understand. You are using beginners books with lots of pictures. Just enjoy!” ? I haven’t heard that comment from my students but I don’t start Free Reading until Feb with my ones, so maybe by then they feel like they’ve got enough Span. First of all, I love this post. Very inspiring! I was wondering if you teach a class for heritage/native speakers, have you done FVR with them, and what “letter level” would you typically recommend for a heritage/native speaker who is just starting to read in Spanish. We use Newsela in my class, which I love, but I was hoping to incorporate more fiction pieces for FVR outside of our novel units. I don’t teach our heritage class, but before we offered a heritage class I’d teach our heritage students in Span 4. Depending on their story, they’re all over the map as far as reading levels… I’d recommend books based on interest rather than level for them. “You like baseball, you might like this book about Felipe Alou”…especially kiddos who didn’t learn to read in Spanish, starting lower and boosting their confidence is a great place to start! Not sure if that’s very helpful… sorry!! What if students ever want to take a book home to read? Do you allow this or would the “check-out” process be too messy? I have a few kids who do but I don’t really have a good system. I just write the kids’ name on a post-it on my desk. I saw a post once by an elementary teacher who made the kids take a selfie with the book they were checking out plus an index card with the date. The kid emailed the image to the teacher. That’s brilliant!! I love it! Thank you!! Train your kiddos what to do if someone else’s bookmark falls out: (sometimes it happens!) if they know what book it came out of, clip it to the front cover (rather than guessing what page the other person was on!!). If they find one on the floor, have a designated spot to put them in (and that’s where they look if they can’t find theirs). I’m starting Free Reading with my Spanish 1s in January, so fun!!! This is so helpful. Thank you! Just wondering what reading work you do with them prior to starting FVR. Thanks! In Sp 1 we read Bart quiere un gato as a Whole class. We also do lots of reading of reading discusses, and a couple other short stories and articles that I’ve written. I think 40 books, at least, so there are a handful of available books, for anyone who doesn’t like theirs and wants another. I usually but 2-3 of each new book so I have a few copies of each. Good luck!! Let me know how it goes!